Galaxy Cb radios. **NEW Nov 2016 Galaxy Dx939F and galaxy Dx979F. New march 2015 Galaxy Dx959B. Excellent service, lowest prices on Galaxy Cb radios. Repair, warranty, Galaxy Cb radio tuning, echo options, talk back and fast world wide shipping on the latest Galaxy Cb radios. New in 2010, Galaxy Dx939. Galaxy Cb radios now have a 3 year manufactures warranty. All of our Galaxy Cb radios come with a factory microphone, power cord, mounting bracket and mounting hardware. This section is for Galaxy Cb radios. To buy Galaxy 10 meter radios see 10 meter radios in the left menu. Don't forget to add our $30 tuning. We also offer a $40 modulation upgrade on select Galaxy Cb models which includes the tuning. For the extra $10 this will make the radio output much louder and "beefier". If anyone other than GI Joe's tunes or works on your Galaxy Cb radio that does void your warranty with us. Tuning includes aligning the receive, transmit, meters, any other necessary adjustments and a visual inspection of the Cb radio. Once we have tuned your Galaxy Cb it will likely never need retuning. If you do encounter a problem you should contact GI Joe's first for help or instructions. 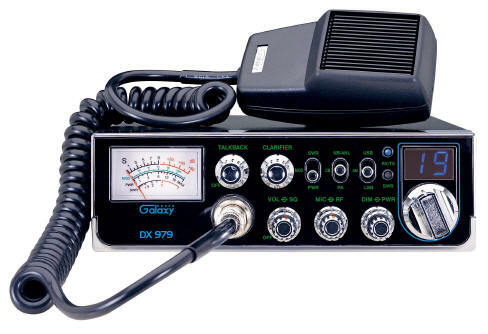 On the Galaxy Cb radio "View Detail" pages you will find more information, three echo options, talk back options and tuning selections. Also there are options to make the Galaxy Cb radio a base by adding a 120Vac to 12Vdc power supply. The smallest power supply listed is the smallest one that will run the Cb radio. You will only need one of the larger power supplies if you plan to run more equipment with higher current (Apmerage) demands. As there are not a lot of base Cb radios on the market the mobile Cb radio with external power supply option gives you more for your money (as compared to a base Cb radio) and a better selection of Cb radio features to fit your needs. New March 2015. 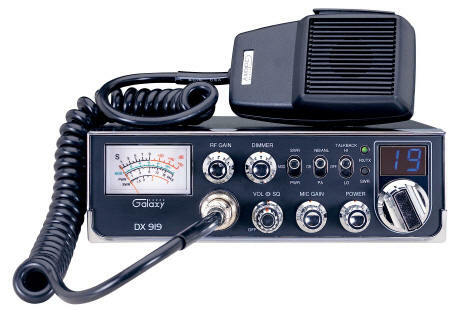 Excellent service, lowest prices on Galaxy Dx 959B Cb radio. Repair, warranty, Galaxy Cb radio tuning, echo options, talk back and fast world wide shipping on the latest Galaxy Dx959B Cb radios. The new Galaxy DX-959B has blue LED's and "Starlight" Faceplate with backlit lettering. The backlit red and blue lettering will appear white in the daylight. The regular Dx959 will also be available. The new lighting is the only difference. Sharp looking Galaxy dX939 Cb radio with backlit green and blue display, blue Channel and frequency counter LED's. 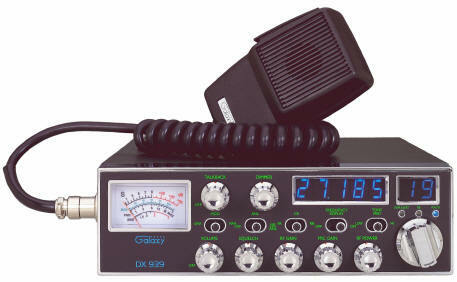 The Dx 929 Galaxy Cb radio now comes with blue LED's and blue meter light. The backlit Starlight faceplate is great for night time driving. Galaxy Cb radios are made rugged for comercial drivers. 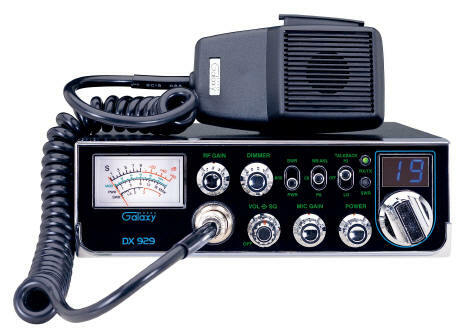 The Dx929 Galaxy Cb radio is very durable and will hold up well for years to come. **Update 5-20-13: This item is discontinued. We will have Factory Reconditioned models available from time to time. The Galaxy Dx 919's ave been discontinued by the manufacture. We will have Factory Reconditioned units when available.